Winnie the Pooh: Exploring a Classic is the UK’s largest ever exhibition to showcase Winnie the Pooh, A.A. Milne and E.H. Shepard. As the world’s leading museum of art, design and performance, the V&A has collected children’s books since its inception in 1852 and has the largest collections of E.H. Shepard’s Winnie-the-Pooh pencil drawings in the world making it the perfect setting to house this temporary exhibition. 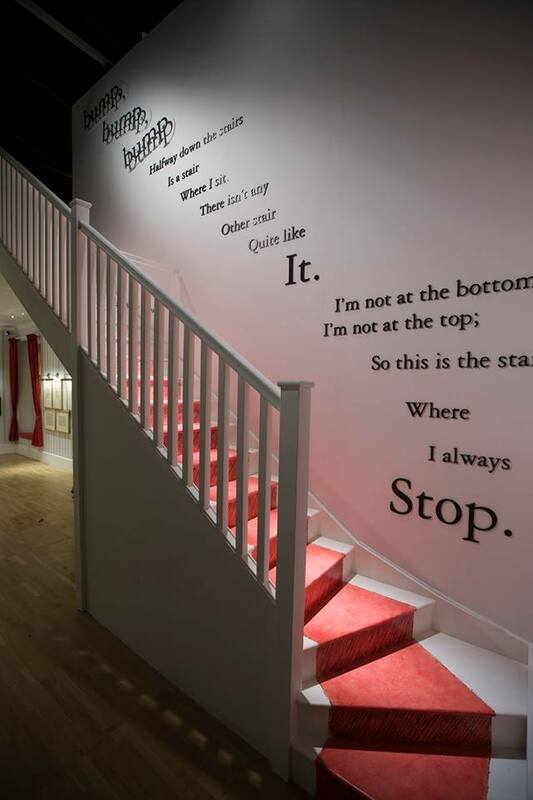 Visitors will embark on a journey that explores the thrilling interplay between text and illustrations, shedding new light on the creative collaboration between A.A. Milne and E.H. Shepard through storytelling and illustration. 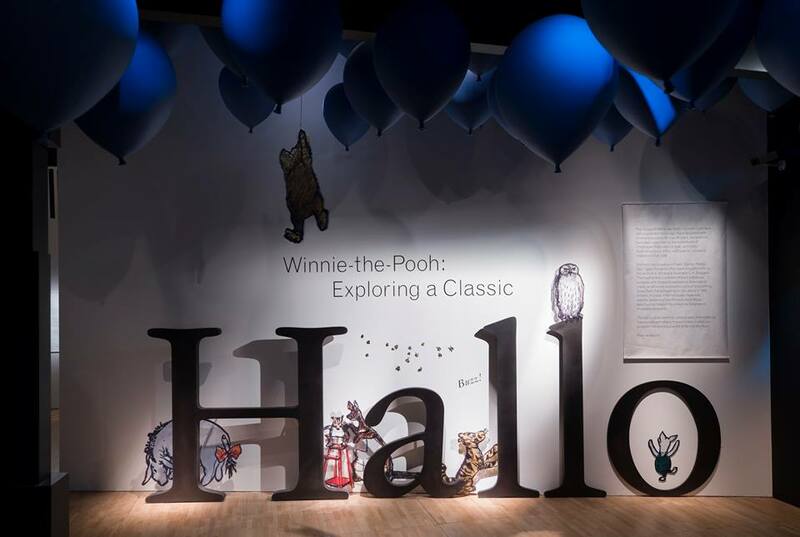 This multi-sensory, playful exhibition reveals the real people, relationships and inspirations behind the charismatic bear, star of the most popular children’s books of all time. 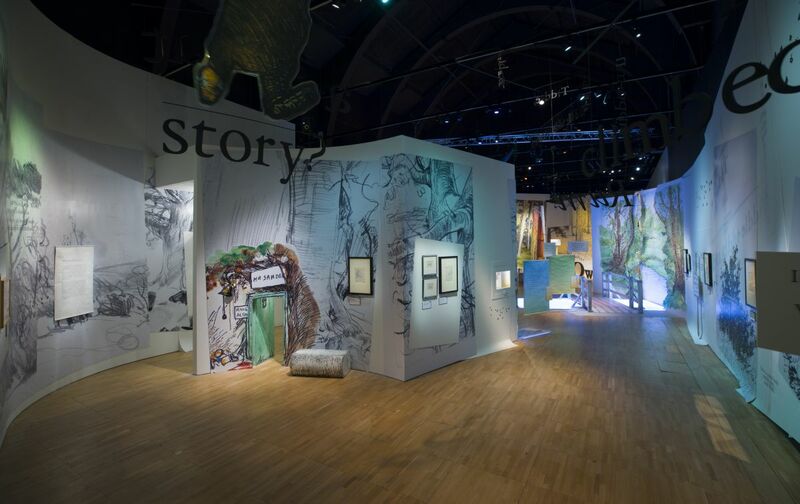 The Winnie the Pooh exhibition takes visitors through 5 narrative spaces including A Very Popular Bear, Truly Inspired, What About a Story, The Art of the Narrative and Presenting Pooh. The opening chapter begins the adventure with A Very Popular Bear where assorted memorabilia are displayed alongside a looping video that shares early Disney animations, footage and music on a 22” display. As visitors continue through to Truly Inspired, children are invited into the nursery of Christopher Robin, where concealed speakers at the window seat mimics the author reading his stories aloud to his son. These charming chronicles of A.A.Milne telling ‘The Hunt for the Woozie’ recreates the magical moments of their shared bedtime stories. Nearby, the inspiration behind the beautifully characterful illustrations of E.H. Shepherd are depicted by a silent film of the artist exploring the forest, and the drawings that resulted from his woodland walks. 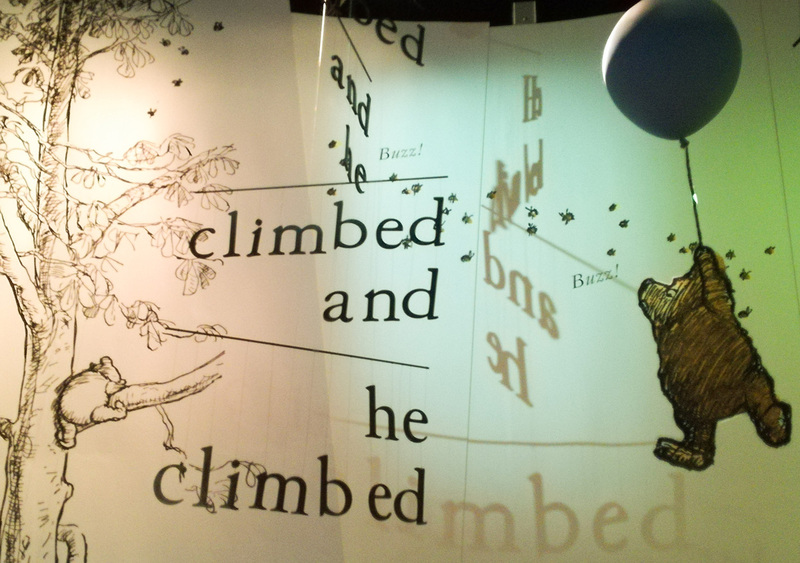 Inside of Owl’s House, an audio extract from ‘In which Piglet Does a Very Grand Thing’ is synchronised with corresponding narrative text, that has been quirkily animated and presented on a 4m single suspended screen with rear projection. More stories and adventures are shared in What About a Story where multiple listening points are scattered throughout the scenery. Directional speakers are disguised within an upturned umbrella and forest trees. As parents and children wander the space, they can enjoy a shared listening experience. The imagination is further activated by an authentic soundscape imitating the familiar sounds of forest wildlife, transporting visitors to the very home of Winnie the Pooh at hundred acre wood. Set across 3 different areas, high level mounted speakers create the illusion that visitors are wandering beneath the trees, following the footsteps of the storybook characters. 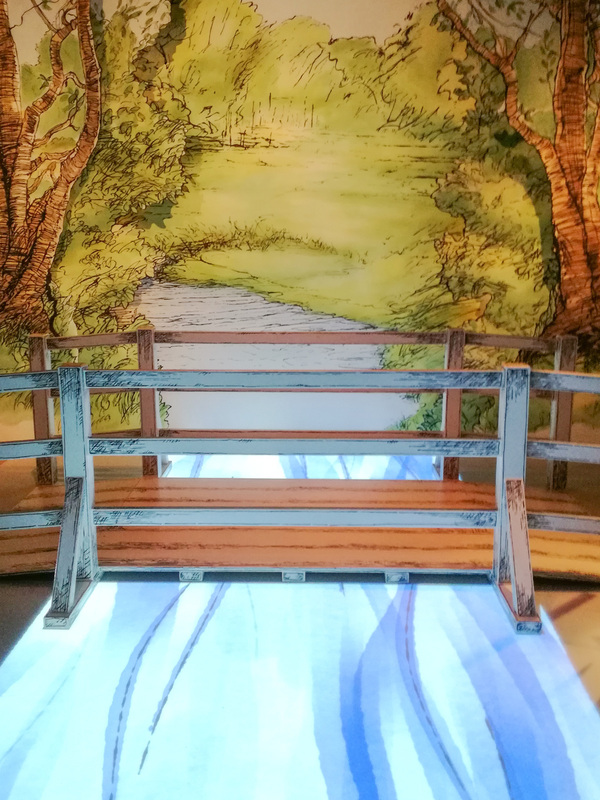 As visitors continue to wander through the setworks of forestry, they can participate in the popular and much-loved game of Poohsticks stepping into the shoes of Pooh and Christopher Robin. On either side of a bridge, 2 floor projections provide the illusion of a river flowing underneath. Working with Newangle, the vibrant scenery is animated with pine cones, sticks and other floating objects that flow under the bridge and race across the finishing line. Presenting Pooh is the final exhibition narrative space that explains the history and progression of these stories through print and publishing. An interactive touchscreen allows visitors to explore a timeline of story extracts, printed editions and archive publications through the years. 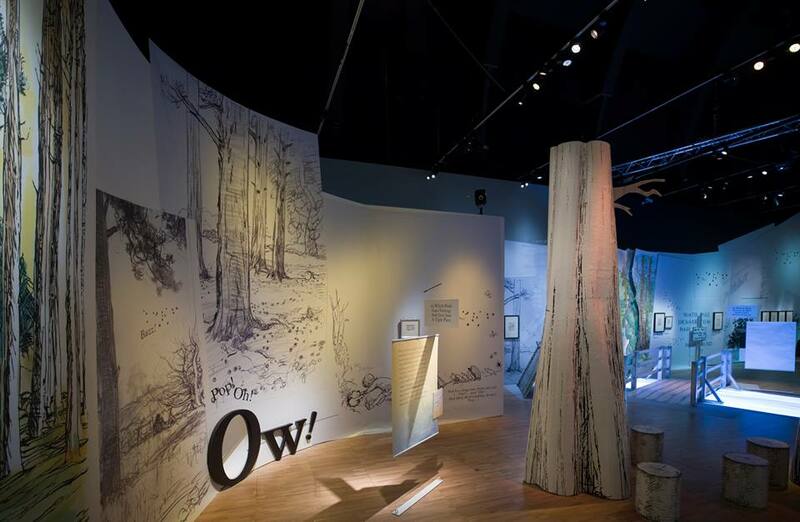 The audiovisual elements successfully translate this creative exhibition in to a live storybook where words and illustrations step out of their pages and into reality, allowing visitors to fully immerse themselves in the world of Winnie the Pooh.